Cheerful foreman working on pc tablet. Happy smiling engineer working on computer tablet, blurred background. Smiling entrepreneur using digital tablet. 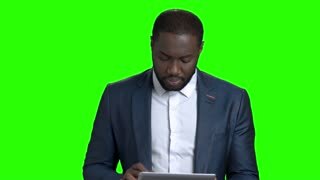 Cheerful afro-american businessman working on pc tablet and looking at camera on chroma key background.